Highlights: - The first drill hole (ALN14-008) into the Anticline Target encountered 1380 max CPS in a 6.5 m zone and max 1850 CPS in a 3.1 m zone (details below). - 3D modelling of VTEM conductivity and ground gravity data points to the strongest conductor being between 300 m and 400 m. - Drill hole ALN14-008 is still drilling. VANCOUVER, BRITISH COLUMBIA—(Marketwired - May 29, 2014) – Aldrin Resource Corp (“Aldrin”) (TSX VENTURE:ALN) is pleased to announce the discovery of radioactive mineralization in the first drill hole (ALN14-008) testing the Anticline Target on its Triple M Property. Aldrin’s Triple M Property is adjacent to Fission Uranium Corporation’s spectacular high-grade uranium discovery at Patterson Lake in northern Saskatchewan. Aldrin employed a Mont Sopris model 2PGA 1000 down-hole gamma logger and two hand-held RS-125 Super Spectrometers to create its field data. 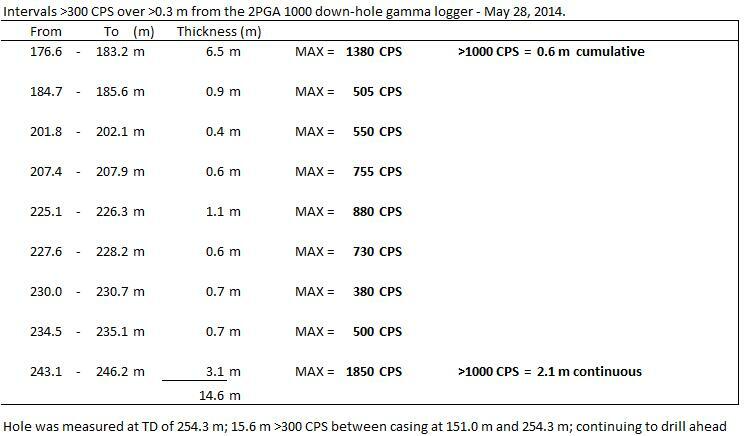 The down-hole gamma logger identified 9 zones between 176.6 m and 246. 2 m depth spanning in total 14.6 m which read values above 300 counts per second (CPS) over > 0.3 m (Table 1). The two highest count zones reached maximum values 1380 CPS (176.6 m to 183.2 m) and 1850 CPS (243.1 m to 246.2 m). Values remained above 1000 CPS over a combined drill thickness of 2.7 m in these two zones, as shown in Table 1. Six of the other zones had high counts above 500 CPS, and the remaining zone had a high count of 380 CPS. Background radiation levels are generally below 200 CPS in the metasedimentary rocks that dominate the drill target area. Aldrin considers intervals >0.3 m thick and with >300 CPS to be significant radioactive mineralization for our exploration program in the Triple M Property area. True thickness has not yet been determined for the intervals. The down-hole gamma logger was run at 254.3 m depth due to high counts encountered by the hand-held RS-125 spectrometers during preliminary examination of the drill core. Drill hole ALN14-008 is drilling ahead to its target depth of 400 m, based on 3D modelling of the coincident VTEM conductive and ground gravity low anomalies, as interpreted by consulting geophysicist Christopher (Kit) Campbell, P. Geop. The 3D modelling suggests that the conductor anomaly strengthens between 300 and 400 m depth (Fig. 1). It should be noted that the 2PGA 1000 down-hole logger records total counts can possibly be derived from potassium (K), thorium (Th) or uranium (U) radiation and thus may not be directly related to uranium content in the drill core. However there was a good correlation reported between total counts and uranium content at Fission Uranium Corp’s Patterson Lake discovery. The actual radioactive source element will be confirmed for the Anticline discovery following chemical analysis on Aldrin’s drill core which will be completed at the Saskatchewan Research Council Laboratory in Saskatoon, Saskatchewan in the coming weeks. The hand-held RS-125 spectrometers were used to analyze the radioactive source in drill core. Thirty-eight separate spectral analyses were collected between 176.0 and 186.25 m at 0.25 m intervals for 120 seconds apiece. The analyses returned an average of 13.8 ppm uranium over that 10.25 m interval, with the two lowest values being 8.3 ppm and 8.7 ppm U, and the two highest values being 24.1 ppm and 28.4 ppm U. As noted in Table 1 above, A continuous 6.5 m within this interval yielded >300 CPS on the down-hole gamma logger, with a maximum values of 1380 CPS, indicating that uranium provides at least a portion of the radioactive source. 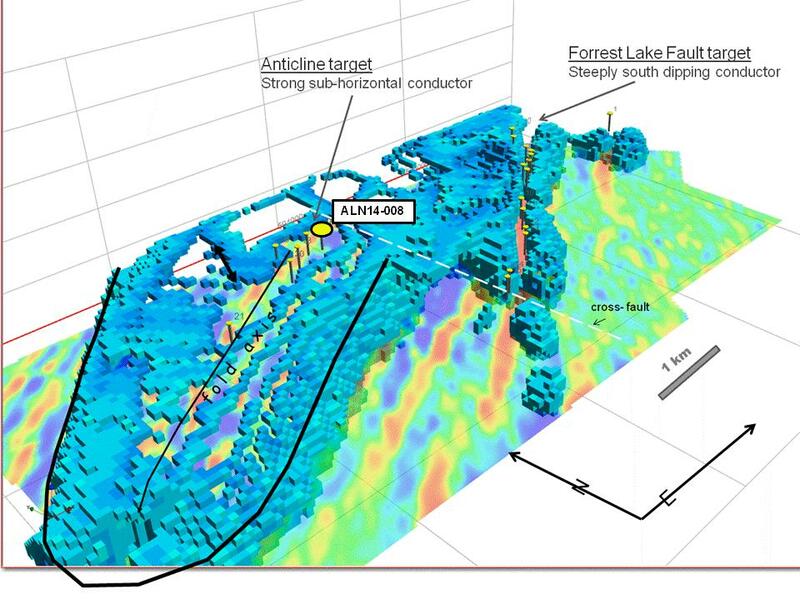 Aldrin’s Triple M Property occurs on structures parallel to both our Anticline and Forrest Lake fault targets. Aldrin tested the Forrest Lake fault target with the first 7 holes of this initial drill program with encouraging intersections of multiple graphitic fault zones, some with elevated gamma ray counts. Aldrin believes the Forrest Lake fault target also warrants considerable further surface and drill exploration, as will be discussed in more detail in subsequent news releases. Dr. Cookenboo is a Qualified Person (QP) by the standards of National Instrument 43-101. He is on-site directing the drill program, has reviewed the technical data described above and approves the contents of this news release.